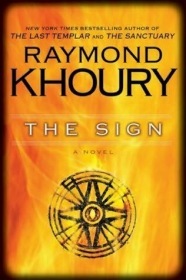 The Sign is the latest book from Raymond Khoury, who is probably best known as the author of The Last Templar. Khoury is skilled at combining history, science, and religion into exciting thrillers. The Sign is somewhat of a departure from his previous books because it takes place entirely in the present and doesn’t have the historical feel of his previous books. However, it does tackle current issues in both religion and science, and also explores what can happen when the influential abuse their power. Gracie Logan is a journalist covering the breaking up of the ice shelf in Antarctica for CNN. While on a live feed, a massive “bright, shimmering sphere of light” appears overhead. It hovers there for a while and then disappears, leaving everyone to wonder what it was. It’s “The Sign,” but a sign of what? God? Aliens? A hoax? The video goes viral around the world, but Gracie is the only reporter on the scene and runs with the story. She travels from Antarctica to Egypt to try to get to the bottom of this mystery. In Boston, Matt Sherwood is oblivious to the breaking news until he meets with a scientist who was an old friend of his brother. Danny Sherwood was killed in a mysterious accident two years ago and Matt is still grieving his loss. The scientist has information about Danny and soon ex-convict Matt is trying to find out what really happened to his brother. In the process of finding the truth, Matt becomes a Jack Bauer type vigilante, which is a little hard to swallow, but fun nonetheless. The Sign is one of those rare thrillers that is not only an entertaining read, but is intelligent and thought provoking as well. The Last Templar also had these qualities and I think that Raymond Khoury has a wonderful talent for making perceptive observations about our society. The Sign sends a powerful message about the role of personal responsibility in creating your own destiny and it’s a message that will resonate with you long after you have read the book. Buy The Sign by Raymond Khoury on Amazon .